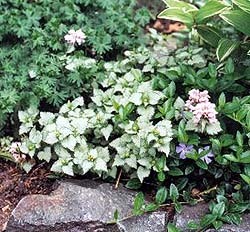 This shade groundcover is unmatched in its ability to liven up a shady area. Foliage is the key here; lamium adds instant pizzazz.I know I’ve said this before, but this time I’m serious: I cannot imagine gardening without lamium. In the north, cultivars to look for include ‘Pink Pewter,’ which features silver leaves with thin green margins and bountiful pink blooms; ‘White Nancy,’ much the same look as PP but clean white blooms; ‘Orchid Frost,’ a newer cultivar with silver centers within blue-green foliage. I grow an older, pink-blooming variety with name unknown to me, in addition to Nancy. Foliage gets very dense as it hugs the ground, rarely rising up more than ten inches, and often trailing outward just above the soil. It gets thick enough that it blocks out weeds. This is a spring bloomer that surprises the garden with waves of bloom here and there through the entire season. You need to loosen and lighten the soil before planting. Making sure the soil contains a good amount of organic matter is helpful in getting lamium to take hold, although once established it wanders freely (without being invasive) and seems to do well in any type of soil. 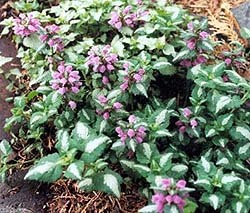 Lamium grows in everything from full shade to part sun, but flourishes in the dappled-shade, woodland environment. It must reseed freely. I never fertilize it, it’s impractical to deadhead, yet each year I’ll find new little bits over here, and a cute tuft I know I didn’t plant over there. You can dig it up any time of year and move it; divide by chopping out chunks with a sharp shovel. Buy it in flats if possible, or get enough pots of the stuff where you can plant it throughout the shady parts of your yard and garden. Water it in well and don’t let it dry out the first to second year. Lamium has a shallow root system. Surprisingly, once established, it tolerates dry soils very well. If it sneaks out into part or full sun, it’ll keep going so long as you keep it moist in sunny, hot locations. I mix it with everything. Under trees, a bench, weaving past hosta, along a pathway or anywhere you want a dollop of magic. And it’s very fashionable right now to use it as a trailer in containers. Leaves and habit like lamium, you can’t put it in the wrong place.